Note how in fig. 2, the repetition marks at the end are used to repeat the entire phrase prior to it （御免なさいまし）. How much of the preceding text is repeated by the elongated repetition marks is something that must be determined by context. The first thing to check would be a repetition of 2 or 3 kana, but in this case, that wouldn't have made grammatical sense. Since the text in question was a spoken quote, repetition of a longer phrase made more sense. Note the use of katakana to denote speech, particularly for interjections, like 「アイ」. The woman, while saying, "That voice is the young husband's" (fig. 4), opened the paper sliding door and hurried in through the warped threshold (fig. 5). Only an opening bracket-style quotation mark is used - the end of the quotation is denoted by the presence of the quotative particle 「と」 . The woman was wearing an Ueda-style thick kimono with dark gray stripes (fig. 6) and a black whale-style obi patterned with small willows, with purple oak silkmoth crape stripes (fig. 7). The "whale-style obi" （鯨帯） refers to a type of women's obi that suggests the contrast between day and night （昼夜帯）. Just like a killer whale, it is black on the back and white on the front. Her undergarments were grayish blue and made of medium size crape (fig. 8) She carried a headscarf in her hands, her disorderly sideburns in a Shimada-style bun (fig. 9). I wasn't sure about the kanji for 「お」 in 「お納戸」 and 「おこそ頭巾」. It seems like it might be 「古」, but that's already used for 「こ」. Note: as Matt noted below, it is most likely the standard kuzushiji kanji for 「お」, 「於」. 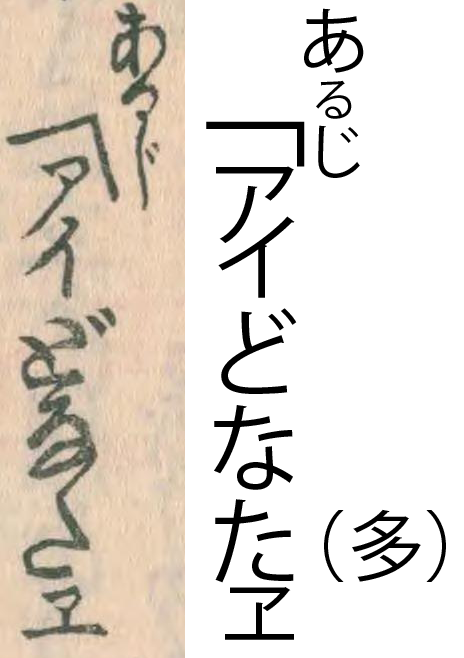 Also, the first kanji in 「島田」 looks like it should actually be 「嶋」 from the kuzushiji (due to the presence of a left radical), but Wikipedia said it was 「島」, so I went with that. Note: from the comments, the first kanji in 「しまだ」 is probably the nonstandard 「嶋」. Whether she was proud of her unpainted face, or had showed up leaving her face as it was when she woke (fig. 10), even though she hadn't tidied herself up/put on makeup, she was beautiful (fig. 11). Note the use of the kana repetition mark 「〱」 near the end of fig. 10 - that isn't a 「く」 ("ku"), it's a repetition mark, so the kanji 「侭」 should be read as 「まま」. 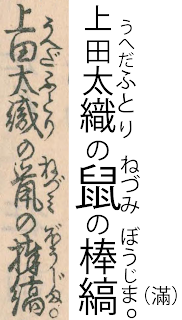 As seen before, 「つくろはねども」 can be broken down into the imperfective form （未然形） of 「繕ふ」（つくろふ）, meaning "to tidy up", the realis form （已然形） of 「ず」, the negative auxiliary verb, and 「ども」, the concessive particle. Note: from the comments, 「繕ふ」 can also referring to putting on makeup (「化粧する」 in modern Japanese). On the flower's [Yonehachi's] smiling face were grieving eyes (fig. 12). This is another place where the kanji being used wasn't clear. 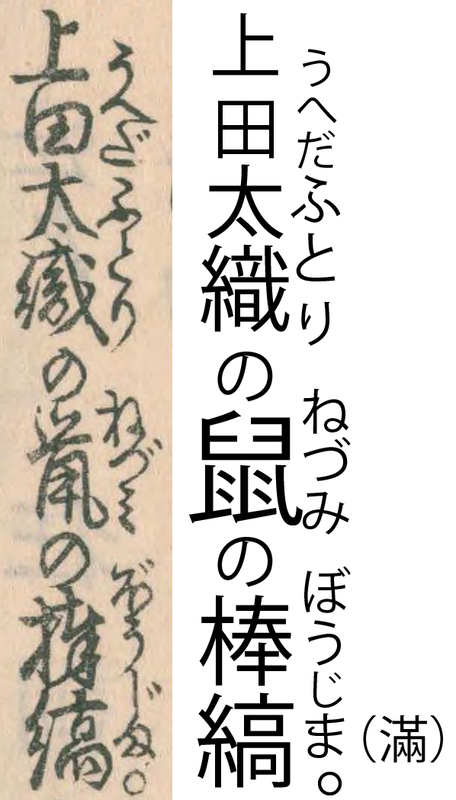 The meaning fits, so the kanji has to be either 「愁」 or 「憂」, but neither look like the kuzushiji kanji seen in the scan. I couldn't figure out what the kanji that the 「も」 in 「めもと」 came from was either. I figured that one out by using the wonderful search tool over at Nihongo Resources. You can do wildcard searches, using "?" for a single character and "*" for any number of characters. 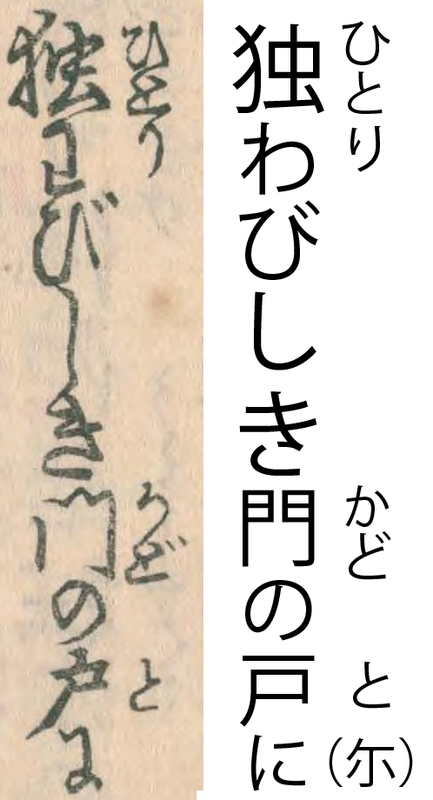 I knew there was one kana between 「め」 and 「と」, so I searched for "め?と", which led me to 「目元」, which I was able to confirm by comparing the handwritten 「元」 to the print one. Note: the kanji from which 「も」 comes is probably also the most common one, 「毛」. As explained in the comments below, 「花」 could be being used as an adjective here, indicating the beauty of Yonehachi's face, rather than being a noun that refers to her (as a person). I agree with you about 嶋! I think that 嶋田 was a not-uncommon spelling for the hairstyle before standardization. Aren't お and も just from 於 and 毛, same as the modern ones? Finally, this may be outside the scope of what you are trying to do, but I think that for a modern reader this passage raises the question of what her appearance means. Are her clothes expensive or cheap? What does a shimada signify about her place in society? Does all this contrast with her unmade-up face, or reinforce it? Etc. I haven't seen this pattern before. Are you just talking about the use of 「花」 to refer to beauty? That's the point I was trying to get across, but it wouldn't have been clear to someone who didn't know the subtext. > I think that the relevant sense of 繕う here is "adorn oneself, put on makeup"
This is absolutely something that I'd like to delve into, but I have no knowledge about this topic at all. I'm actually reading a book on Heian culture right now - do you have any similar suggestions for Edo culture? I see this book might be helpful, but I'm rather out of my depth here. Japanese-language sources would probably be best, but as I'm not in Japan, I'll see if I can scrounge up some stuff online and maybe dedicate a later post to fashion as it appears in Umegoyomi. > I haven't seen this pattern before. Are you just talking about the use of 「花」 to refer to beauty? Yep, if it is the 花の I am thinking of it is often "translated" as basically 華やかな. "花の衣" is an example of the same pattern I think and should be in most 古語 dictionaries (as it appears in the 古今集 etc.) Basically, what I mean is, I don't think that 花の...顔 means "the face of the flower [i.e. Yonehachi]", but rather "[Yonehachi's] lovely face" or "[Yonehachi's] flower of a face". But, as I mentioned, I don't know for sure. The syntax would certainly allow for the author simply calling Yonehachi a flower as you say. Re the culture thing -- no, I only know bits and pieces and look things up myself in this area. I would love to be able to say "Oh, grey stripes and a shimada? That makes her between 17 and 23 years old, the second daughter of a family in the lower 40th percentile of wealth etc." but I'm a long way from that yet! I actually have a copy of this book somewhere but never got around to reading it. That's why I'm urging you to do the heavy lifting instead, heh.